Flanders Company has been producing high quality handcrafted handlebars since 1945. All of the Handlebars featured on the following pages are made of high quality seamless cold drawn steel tubing. They're polished, bent by the mandrel method thereby eliminating unsightly flat outer sections and then chrome plated or black powder coated to perfection. Shipping to you at our Costs: We will add shipping costs to your handlebar order and charge you only at our cost - usually around $17 ground UPS in the United States and into the $30+ range for larger bars (orders less than $20.00 will be subject to a $2.00 service charge to offset the handling and billing charges). 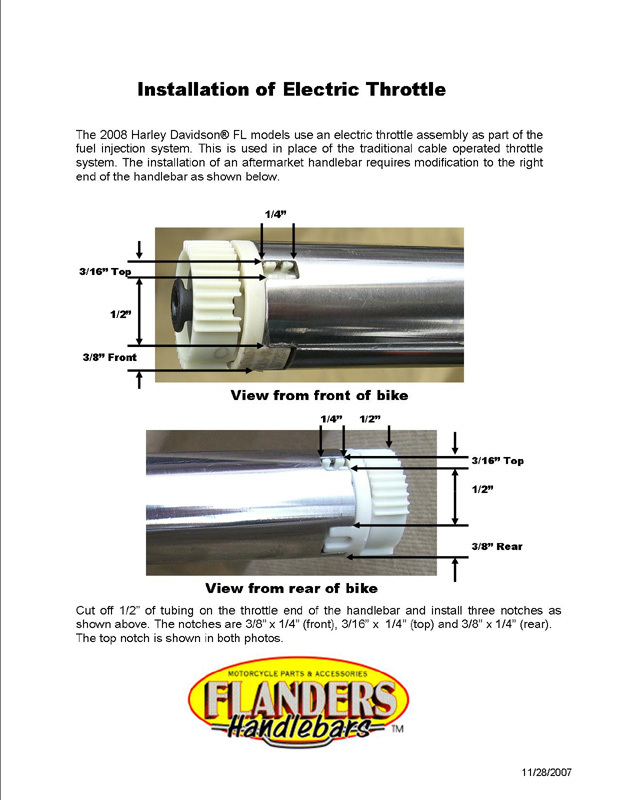 We are a little behind in updating our Flanders Handlebars web pages. Click here for a complete 2011 Flanders Handlebar Catalog or the below logo.
. If the bars you want are not listed in the web pages, you can click and order via our Secure On-Line Order Form. Flanders Company measures handlebars differently than Harley. We measure the center before the bend begins as shown on our website where as Harley measures to the center of the bend as shown in their Accessory Catalog.